Hello there! I think it is about time to open the good ol’ commission box! WITH NEW ADDITIONS! FULL BODIES ARE BACK! Payment shall be done via Pay-Pal. I will send an invoice when I am passed the sketch phase which must be approved and paid before I continue. I still struggle with drawing females, just putting that warning out there. All files will be PNG with a transparent background. PSD files are available if requested. And that’s it! Thank you in advance! I think I could be interested in a commission, but sadly, I play a female character, and it seems like you don't draw them that much. However, great job with your artwork, I really enjoy the chara-design ! It's true that I'm rusty doing female characters, but that does not mean I won't try! I'm getting paid on Friday, and as soon as I make sure I have the disposable income, I'll gladly sign up for a $25 piece for Remmy. I'm still open, I'll gladly do one for you once you're all set! 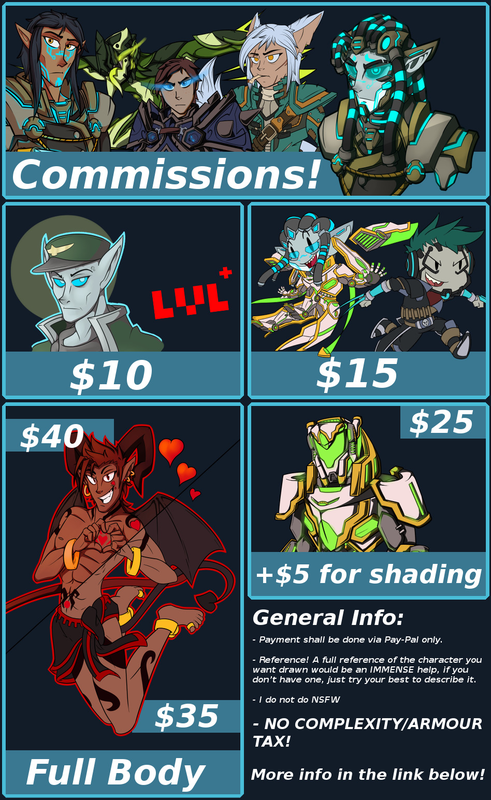 Updated with new Commission examples and services! Sweet! PM me your info and I can get to work on it right away!